It's been a while since I've last taken a look at a new product from Arctic. This company was founded in 2001 and made a big name for itself thanks to its series of processor and video card coolers. These days, the company also offers a wide variety of consumer accessories and audio products, but I think most people still associate Arctic with cooling products. In this review I'm taking a look at the new BioniX fans. These were introduced a couple of months ago and they're positioned as this new flagship fans from Arctic. As the names suggest, the BioniX F120 is a 120mm model, while the Bionix F140 has a diameter of 140mm. These fans were designed to offer a low noise level, low vibration and high airflow output. A lot of the new fans that hit the market this year try to distinguish themselves by featuring fancy RGB LED effects but Arctic decided to take a different path. There are no LEDs here but you can choose between four frame color options: black/red, black/green, black/yellow and black/white. All versions come with an impressive 10-year limited warranty. For our test we got a red BioniX F120 and a yellow BioniX F140. There's a lot to like about the retail packaging, it has nice photos that show off the fan's features and the rear has a table with the basic specifications. The box is made of thick cardboard. I'm not sure if it was done intentionally, but I applaud Arctic for the environmentally-conscious design. They did not use any unnecessary plastics. Do fans need an instruction manual? Probably not but if you need help you can go to support.arctic.ac/bionix or scan the QR code with your smartphone or tablet. Besides the card with the QR code, the box also features a little plastic bag with four standard fan screws. Let's start with the red BioniX F120. This model measures exactly 120mm x 120mm, has a thickness of 27mm and weighs 122g. The BioniX series is aimed at gamers so that's why Arctic opted for the aggressive color combinations. Some of the color combos are rather bold and I like how Arctic colored the round ring and pieces of the corners of the frame. Some other companies, like Fractal Design, go with a black frame and colored fan blades. The Arctic BioniX series is a bit more unique. Here's a closeup of the front of the fan. I forgot to remove the plastic cover from the fan rotor cap, behind it is a shiny Arctic logo. The BioniX F120 PWM fan spins at 200 to 1800RPM, which is a very wide range. At its peak, the fan offers an airflow of 69CFM. The noise level is rated at 0.5 Sone, which corresponds to roughly 24.4dBA. Sone is a linear unit of loudness, a fan with a sone level of 1 is double as loud as a fan with a sone level of 0.5. Arctic is about the only company in the computer cooling industry that insists on using sone, everyone else uses the logarithmic decibel scale. One thing I don't like is that Arctic doesn't share a lot of specifications about its fans. The company does not provide details about static pressure or mean time between failures (MTBF), two metrics that are commonly shared by other fan makers. The rear features the same color combo design as the front. We can see that this is a 12V DC fan, like all other consumer PC fans, and that it's rated at 0.20A. This results in maximum power consumption of 2.4W. This new flagship fan from Arctic features fluid dynamic bearing (FDB). Arctic claims the fan uses a new alloy/lubricant combination developed in Germany. The benefits of this design include lower friction and greater efficiency. The company mentions in its marketing materials that the BioniX F120 has a 3-phase motor that typically runs at just 35.3°C, whereas the average 120mm fan with a 1-or-2-phase motor hits a temperature of 54.5°C. Arctic explains the lower motor temperature quadruples the fan's lifespan, which is reflected by the 10-year warranty. Another special aspect of the rotor is that it features vibration absorption. The motor has a steady torque and smoother switching of the magnet field. Arctic says this removes the need for rubber spacers, the company's own testing indicates these fans absorb 95 percent of vibration versus fans with a regular motor. 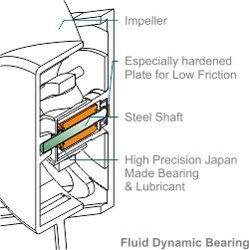 Here's a picture that shows how the fluid dynamic bearing works. The BioniX F120 has a 400mm long cable with a 4-pin PWM plug plus a pass-through connector. This lets you daisy-chain multiple fans to a single 4-pin PWM fan socket on your motherboard. All daisy-chained fans can be controlled synchronously via PWM Sharing Technology (PST). The cable is fully sleeved. For our last picture of the BioniX F120, here's a look at the rotor cap with the plastic cover sheet removed. On its website, Arctic mentions it optimized the fan blades for high airflow and low noise, but the company doesn't go into the details. In the previous paragraphs, I covered the F120 design in detail so the overview of the F140 will be a bit more concise. The BioniX F140 measures 140mm x 140mm, has a thickness of 27mm and weighs 184g. The 140mm variant is rated at 0.25A and has a maximum power consumption of 3W. The motor spins at 200 to 1800RPM, the upper end of the range results in an airflow of 104CFM and a noise level of 0.6 Sone (~25.3dBA). Just like its little brother, the F140 has a 400mm long sleeved cable with a 4-pin PWM connector and a pass-through connector. While the insets in the corners look like rubber, they're actually plastic. Arctic says the use of rubber anti-vibrational components isn't necessary due to the new technology employed by the fan's motor. I compared the BioniX fans to a pair of Noctua fans using my AR824 sound meter. The noise measurements were taken in a realistic setting, with an ambient noise level of 40.5dBA. 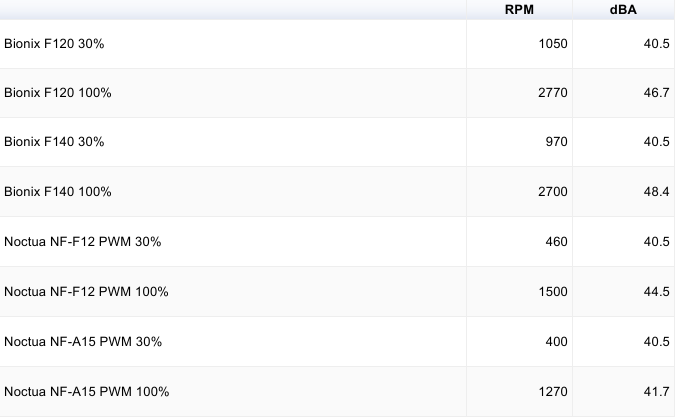 At full speed, the BioniX fans are noticeably louder than the Noctua fans but there's a big difference in the airflow. The Notua NF-F12 PWM delivers an airflow of 54.97CFM, whereas the BioniX F120 is rated at 67CFM. Similarly, the Noctua NF-A15 PWM's specification sheet lists 67.98CFM, whereas the Arctic BioniX F140 fan delivers 104CFM. The table below contains the measured RPM and decibel level. The noise levels measurements were taken at 50cm distance from the fan. The readings confirm my subjective hearing test. The BioniX fans deliver a lot more airflow but are noisier at full speed. However, when dialed back to 30% there's no noticeable difference as all four fans disappear into the background noise. The noise can be described as a normal hum, without any peculiarities like irritating whiny or irregular noises. One minor issue perhaps, the RPM readout of these fans is not accurate. The measured values are far higher than the specifications of these fans. Arctic's new BioniX fans deliver a lot of airflow and will rapidly remove heat from your chassis or heatsink. The company boasts these fans have a longer lifespan thanks to a new 3-phase motor and backs up this claim by offering a 10-year limited warranty. Noctua fans are covered by a 6-year warranty so an extra four years is a nice selling point. The fan speed can easily be controlled via software tools and Arctic's PWM Sharing Technology enables you to daisy-chain multiple fans to a single PWM header. At low speeds, the BioniX fans are really quiet but towards the upper end of their RPM range they're kinda loud. But that's not unusual given the high airflow rating of these fans. Overall, I have no problem recommending these fans if you desire a colorful design without fancy RGB LEDs. The MSRP of the BioniX F120 is 14.99EUR, while the Bionix F140's MSRP is 15.99EUR. It's relatively expensive versus regular 120mm and 140mm fans, but somewhat below the pricing of premium fans from other cooling firms. 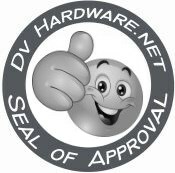 DV Hardware gives the Arctic BioniX series fans a 8.5/10 and our Seal of Approval.